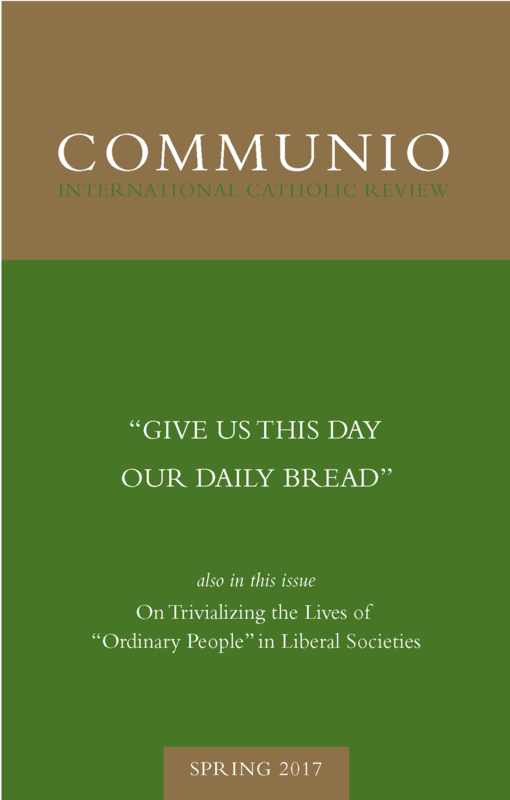 Communio’s Spring 2017 issue continues our series dedicated to the “Our Father,” focusing on the petition “Give us this day our daily bread.” God faithfully sustains his creation at all times, but calls man, who is made to live “on every word that proceeds from the mouth of God” (Mt 4:4; cf. Dt 8:3) to a more radical share in his own life through the gift of the Incarnate Word, the “living bread come down from heaven” (Jn 6:51; cf. Ex 16:4). Nourished on the fruit of Christ’s sacrifice, human freedom comes most fully to itself. By the reception of this gift, daily life is inwardly enriched with the Son’s own eternal offering of gratitude to the Father. Jacques Servais, in “Asking God for What We Do: On an Aphorism of Ignatius of Loyola,” opens the prayer for daily bread into a reflection on how radical trust in God is the very source and safeguard of human freedom. Taking bearings from a saying commonly attributed to St. Ignatius, Servais shows how authentic Christian “indifference,” the readiness to entrust oneself to God’s will and to carry out this will without reserve, overcomes the parallel temptations of sheer passivity and sheer self-reliance. “The spirit of initiative, which is indispensable, is now founded on a living faith in God; and perfect surrender to the divine will now demands that we make use of all the means at our disposal in order to realize it.” In this way, dependence on God for all our necessities, the very dependence we confess in asking the Father for our daily bread, liberates the Christian for fruitful action in the world. In “Between a Criticism of Evolution and Atheism: A View on the Philosophy of Thomas Nagel,” Engelbert Recktenwald explains why only a God who creates in infinite wisdom and freedom can guarantee the relative independence of the finite world. Recktenwald comments on a prominent philosopher of science, Thomas Nagel, who holds that Darwinistic naturalism undermines the very reason and intelligibility on which it depends. Despite this critique, Nagel remains an atheist in the name of fidelity to the integrity of nature. “According to him, Darwinism and theism resemble one another in that they both push intelligibility out of the world, one by positing the contingency of mutation and the other by taking recourse to divine freedom.” Far from casting doubt on the created order, Recktenwald responds, the structure of the cosmos is intrinsically intelligible only because it is personally bestowed through the divine Logos. David L. Schindler, in “On Trivializing the Lives of ‘Ordinary People’ in Liberal Societies,” makes a case for the centrality of God and the good to all conscious and free human action, including everyday participation in economic life. Francesca Murphy claims in a recent article (“Is Liberalism a Heresy? Why Liberalism and a Market Economy Are Based on Christianity,” First Things [June/July 2016]) that the liberal market economy, on its own terms, adequately captures the drama of personal existence and serves as a precursor of the mutual giving-and-receiving that is the life of grace. Responding to the substance of this claim, Schindler argues on the contrary that this drama is generated first by the implicit awareness of God’s presence at the origin of human intelligence and action, a presence which the supposed neutrality of liberal institutions formally disregards. “What liberal societies do not—and as a matter of ‘official’-public principle cannot—take into account is the interior order of the market’s specific activities and ends as these (implicitly) concern man’s ultimate good.” Schindler argues, then, “that there is in fact much more drama” going on in the activity of “ordinary people” in the liberal market than Murphy recognizes. In Why We Need . . ., Philip Gonzales presents an essay on Erich Przywara. Gonzales argues that the mysteries of the Incarnation and divinization stand at the center of Przywara’s classic interpretation of the analogia entis. The Ignatian principle of serving God’s ever-greater majesty animates and forms Przywara’s metaphysics, so that, “at its beating core, the analogia entis is expressive of an analogia caritatis between man and God.” If human existence is characterized by obedient response to God, then it is ordered from its very roots to participation in Christ’s Paschal ascent to the Father through loving surrender on behalf of the world. In Retrieving the Tradition, we publish Erich Przywara’s “Eucharist and Labor,” in which he takes up the question of how the Eucharist transforms and guides the Church in her daily task. The grace imparted in the Mass commends the communicant to a definite work for the sake of the world in the present day. “Christ unites himself with the soul in order that his countenance might shine in it anew. Now he desires, through the labor of those souls who are renewed in him, to also light up the world, from its depth, with the brilliant radiance of his features.” In the end, Christian labor can only be vivifying for others in the measure that it receives its form from the Crucified. Retrieving the Tradition also features two selections from Our Father by Alexander Schmemann. In this reflection, Schmemann concentrates on how the prayer is directed in each petition towards ever-deeper communion with God, as evidenced by the request for bread today. Given to support man in his natural task of praising and becoming likened to God, daily bread is a sign of God’s pervasive, unbroken generosity. “‘(You) give us’: this means that the ultimate source of all this for us is God himself, his life, his concern for us; in whatever form or from whomever we may receive the gift, all is from him.” The promise hiddenly contained in bread, living and everlasting intimacy with the divine source of our being, is fulfilled in the daily sacrifice of the Mass.